You’ve just setup your fantastic new website and you’ve added valuable content that your visitors are going to absolutely love. The problem is you aren’t sure if anyone is actually visiting, and if they are, you don’t know who they are or where they are coming from. This is where Google Analytics comes in. Google Analytics is a Google service that allows you to track useful statistics for your website such as page views, visitor demographics, and visitor behaviour. It’s an essential tool for tracking your website’s performance and allows you to identify where your site is performing well and what areas could be improved. Before you can begin tracking your site’s traffic you will need to sign up for a Google account. The Google Account used for Google Analytics is the same account used for other Google services like YouTube and Gmail. 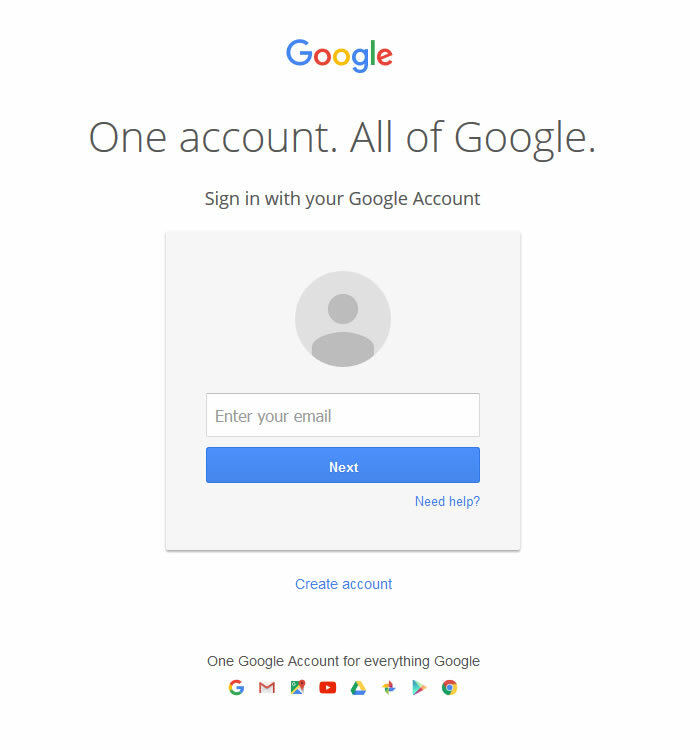 If you do not have a Google account already you will need to sign up for one. 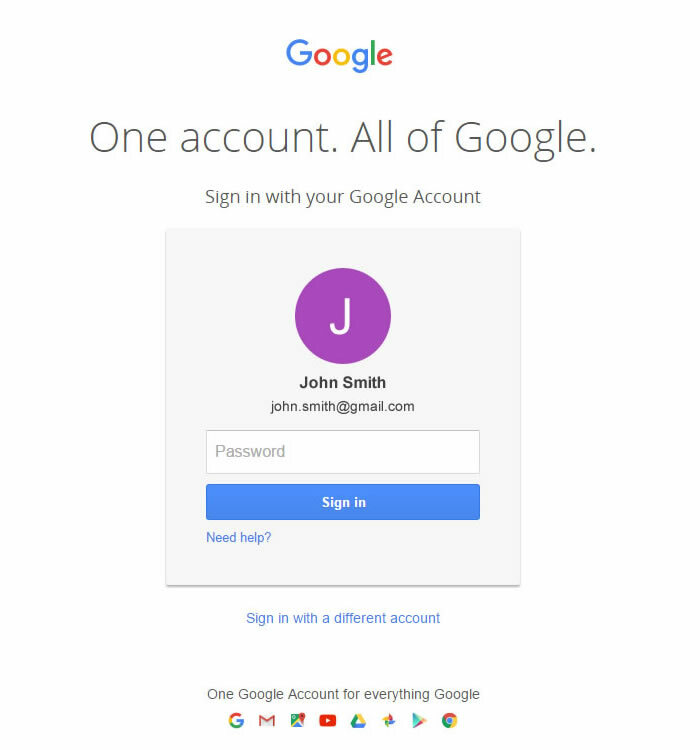 Go to https://accounts.google.com and click the “Create account” link below the login form. If the “Create account” link isn’t visible, click the “Sign in with a different account link” below the login form. Then click the “Add account” button and finally click the “Create account” link. Complete the form with your details and click the “Next step button. Scroll to the bottom of the Privacy and Terms notice and click the “I agree’ button. 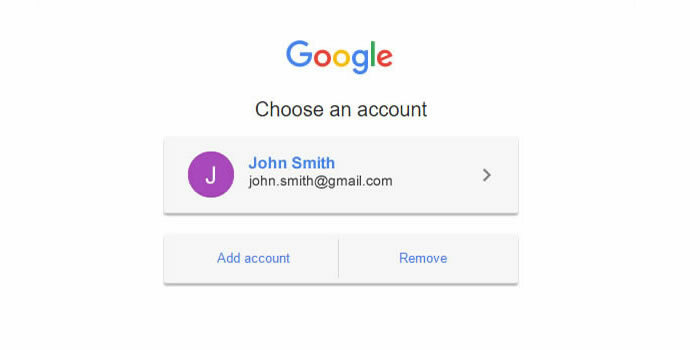 Your Google account is now ready to go and you’re ready to create a Google Analytics account and generate a tracking ID for your site. Go to https://analytics.google.com and click the “Sign up” button. Select “Website” from the two options at the top. Give your Analytics account a name. It doesn’t matter what the account name is so you can either use your website’s name or the name of your business. Just note that you can add / manage multiple websites from one Google Analytics account. Complete the rest of the form by entering your website name and URL, selecting the industry that is most relevant to your website, and selecting the timezone you want to use for your website’s reports. Click the “Get Tracking ID” button to submit the form. You will be shown the Terms of Service agreement which you will need to read and accept. You should now see the Google Analytics dashboard which should look something like the screenshot below. The most important thing to note here is the Tracking ID which you will need to add to your website for Google Analytics to collect data. You can add the Google tracking code manually, however, there are some great plugins available that will automatically add the tracking code to your site, provide some handy extra settings and even display basic statistics in your WordPress site’s admin dashboard. 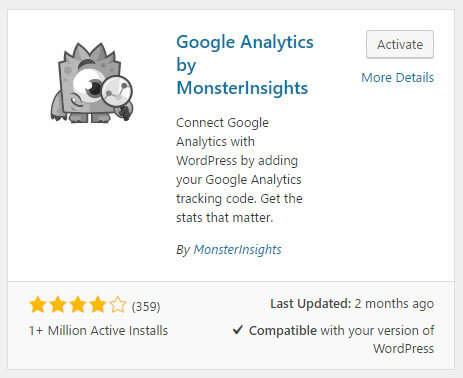 For this tutorial, we’ll be using Google Analytics by MonsterInsights. First, we need to install the plugin so log in to your WordPress site’s admin dashboard and go to “Plugins > Add New”. 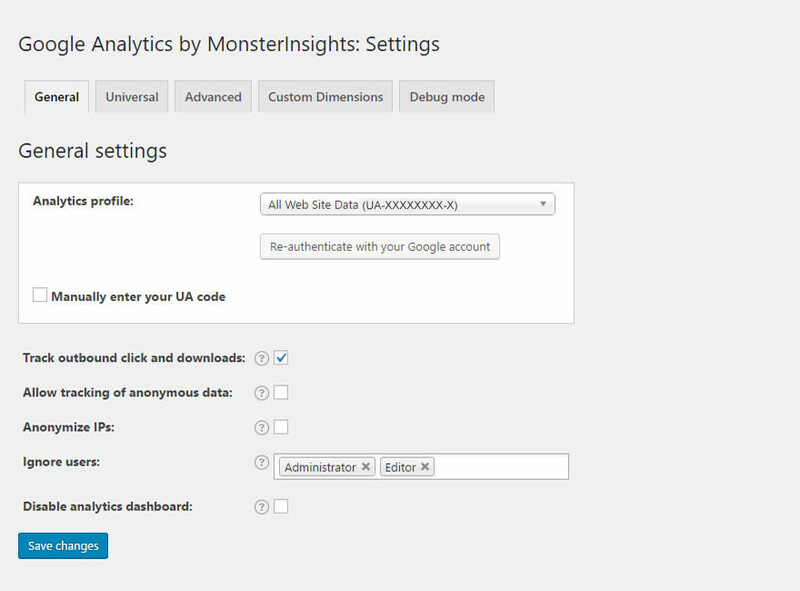 Search for “monsterinsights” and find the Google Analytics by MonsterInsights plugin in the list. Click the “Install Now” button and, once the plugin is installed, click the “Activate” button. Click the “Insights” link in the admin dashboard sidebar to go to the plugin settings page. The plugin can automatically add the tracking code to your if you authenticate your Google Account. To do this click the “authenticate your Google Analytics profile here” link. Click the “Authenticate with your Google account” button. You should see a popup asking you to log into and / or authorize the plugin with your Google account. Click the allow button. Copy the code from the popup window into the highlighted “Paste your Google code here” text field and click the “Save authentication code” button. Select your website profile from the “Analytics profile” drop-down selection. Most of the settings can be kept as default but you are free to change them if you would like. Don’t forget to click the “Save changes” button when you are finished. And that’s it! 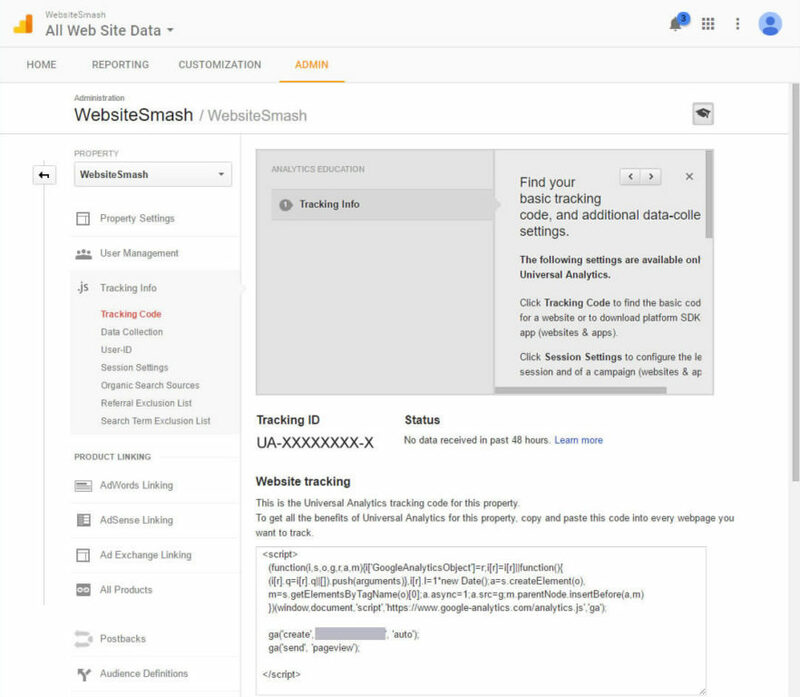 The Google Analytics tracking code will automatically be added to the pages of your website. You can view your site’s Analytics data by going to Google Analytics, clicking the “Home” tab and then clicking the “All Web Site Data” link under the website name in the list. It can take a few days for the data to begin to show. Eventually, you’ll be able to see all kinds of useful information that you can use to improve your website.